Software testing is an important aspect of the software application development cycle. Service virtualization plays a big role in software testing as it provides the user with the ability to test the application under various possible events which can be expected from the backend service. If the actual backend used by application is not ready to be integrated for testing that is one possible case where a virtualized service will be useful. One other important use of a virtualized service is imitating backend service failures and tests the application’s robustness under those failures. For example if we need to test whether our application will fail when the backend service is not available or not, a virtual asset can mimic a backend time out situation and this can be used to test our software. 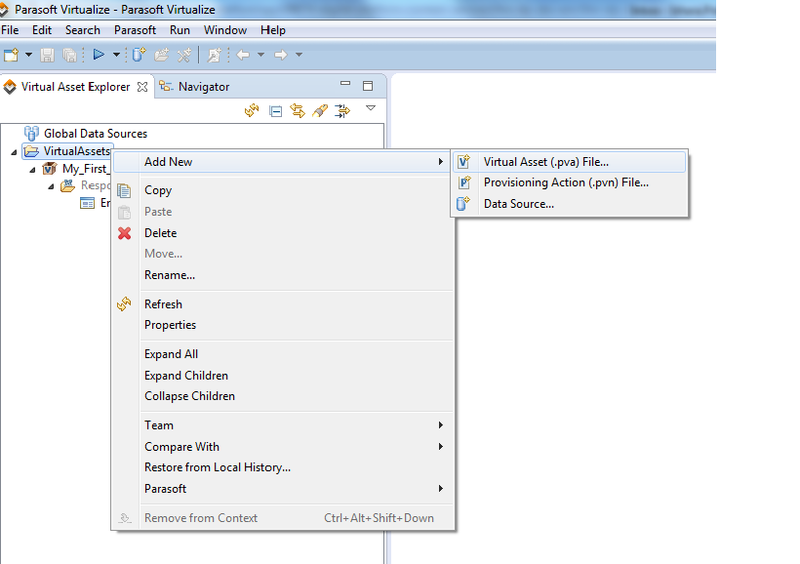 This will create a new Virtual Asset (referred as VA from here) in the workspace with a Responder Suite. Responder suite is the container where we are going to create one or more virtual responses to be returned to the client application. In order to add a response we need to create a ‘Responder’. There are many type of Responders can be created from Parafost Virtualize. Some of the common examples are XML or JSON responders, Literal responders etc. 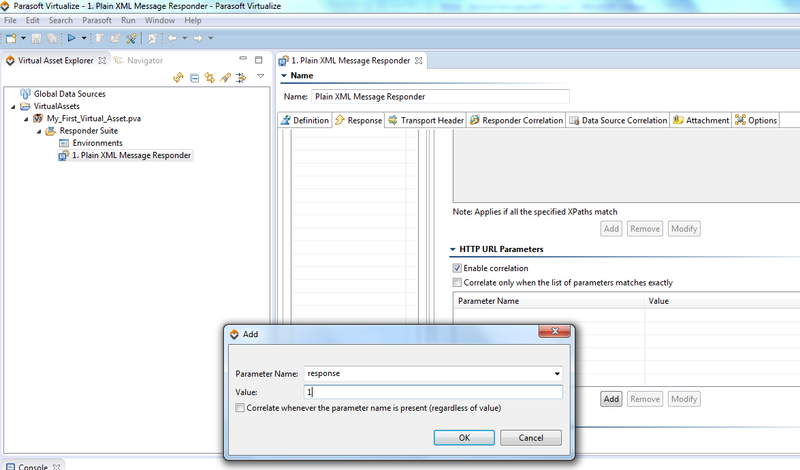 It is possible to add more than once responder to VA, and correlate it with an incoming http header, url parameter, request body element etc. As the first steps let’s add a XML responder. An XML responder will return an xml message when it is called. For this follow Responder Suite -> New tool -> Plain XML Responder. Then add a XML message to response body. Now let’s correlate this XML responder to a url parameter which is coming from client application, so when the Virtual Asset is called client needs to pass that specific url parameter in the address if it needs to have XML responder in return. For that go to HTTP URL Parameters and select ‘enable correlation’. Then give a parameter name to correlate. In order to get this XML response the client will call below address. If we need to return some response from VA based on the value of an incoming HTTP header, that can be done using header correlation. Let’s add the JSON Responder this time. Add a JSON response. Assume that we need to test when a backend service fails and return HTTP Status as 500. It is not possible to break the real backend service for us to get 500 from it. So we can create a virtual responder which returns 500 and test our application using that. For this create the Response as explained in above, and go to Options -> Return Status. By default responder is configured to return HTTP 200 OK. Unclick that and then we can add whichever HTTP_SC code and message that needs to be returned with the Responder. A Responder in VA can be configured with a response time delay which can be used to test a backend timeout situation. First point the client application endpoint to the VA’s address. Then we can create a Responder and wait for certain amount of time before sending that response. For e.g if the endpoint timeout is 5 seconds, then give the Responder delay as 10 seconds. So when the VA is called it will wait for 10 seconds before send the response back to client application. By this time client’s endpoint will have timed out after 5 seconds. Now let’s test this Virtual service. By default the VA is already added to the local server. 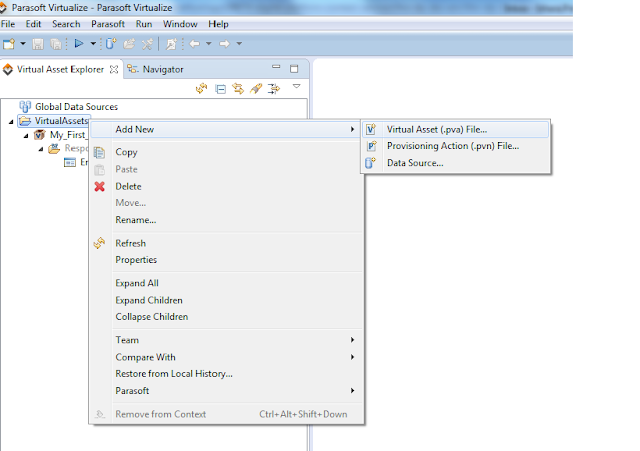 The ‘Servers’ pane in Parasoft Virtualize displays the existing servers list. You can add any remote servers to this too. As there are many responders, I am going to test one response with a url parameter. Below is the full request/response in POSTMAN.